"This is not a trivial amount." VANCOUVER - Blue bird days on the ski slopes and expeditions to rivers frothing with spawning salmon could be among the quintessential British Columbia pastimes that vanish in the next century if the province's glaciers maintain their melt. Results of a 3D computer simulation reveal in more detail than ever before the magnitude of glacial thawing due to climate change. The study was published Monday in the journal Nature Geoscience. It confirms and goes one step further than previous projections on glacial melt, holding up a magnifying glass to specific geography in Western Canada and spurs scientific theorizing about potential localized impacts. Researchers anticipate that by 2100, disappearing glaciers may alter how much water is delivered to salmon-spawning beds in the B.C. Interior, and similarly dry up corporate visions of future ski resorts, said study co-author Garry Clarke. A near total loss of glacial ice is expected to be concentrated in the Rocky Mountains, said Clarke, professor emeritus with the University of British Columbia. "People driving into Banff or Jasper parks will be hard pressed to see glaciers in the landscape by the time this is played out," he said. Similar disappearance rates are expected in B.C. 's southeastern Columbia Mountains. But the southern coast mountains may fare better than previously expected, mostly sparing the visually stunning Mount Garibaldi, north of Squamish, B.C. Ice caps in B.C. 's northwest, close to the Alaska and Yukon borders, should also survive. Researchers spent nearly a decade coding and embedding influential factors into the simulation, amounting to high-resolution representations of the glacial degradation in B.C. and Alberta over the years, said Clarke. While the entire region currently sustains 3,000 cubic kilometres of ice, that's projected to degrade between 60 to 80 per cent using the simulation, which charts four possible courses based on standard future climate change scenarios. The study projects the maximum rate of ice volume retreat to occur between 2020 and 2040. Earlier forecasts using less sophisticated calculus predicted the glacial mass loss would be lower. "This is not a trivial amount," Clarke said. "This is in the world-league in terms of how many glaciers we have in our mountains and what the losses will be." He said the big unknown is human behaviour — how rapidly the glaciers flow eternally into the ocean depends on carbon dioxide and greenhouse gas additions to the atmosphere. It's a "one-way trip" if melt rates worsen or even continue along the current trajectory, he said. 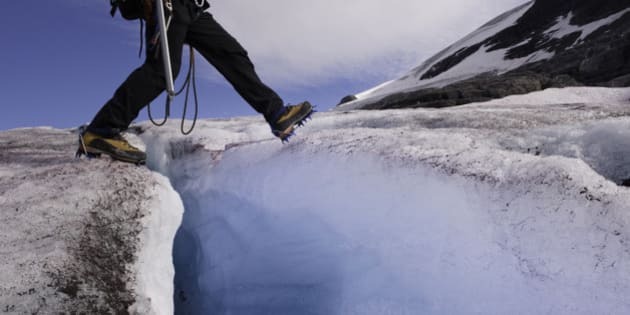 But the simulator also showed unexpectedly positive outcomes where some glaciers could outlast the prediction if climate change stabilizes, he added. "I thought that we might not even have a possibility of a good result, even if we behaved really nicely," he said. "But this suggests there is a reward for good behaviour." Digital pictures of the models at increments from 2010 to 2100 look exactly as if photographed from satellites, but are truer to life because they simulate the physics of ice flow, said Clarke. The novel simulator is more sophisticated than other calculators, using technological prowess similar to flight simulation or car racing programs, he said. "You've got the physics that describes what's going on. You try to put as much as you can in there. And if you've done a good job, it resembles the system you're trying to emulate," Clarke said. The team included factors such as the strength of the Earth's gravity field, the melting temperature of ice, and accounted for precipitation falling as snow or rain depending on elevation. But Clarke noted that in some ways, the melt isn't as dire in Canada because the glacial water doesn't sustain huge populations. He's hoping the simulator will be adopted by glacier experts in Asia and South America, where people's livelihoods depend on access to water.